There was much looking at London architecture on the Windows and Death Ride at the end of December. 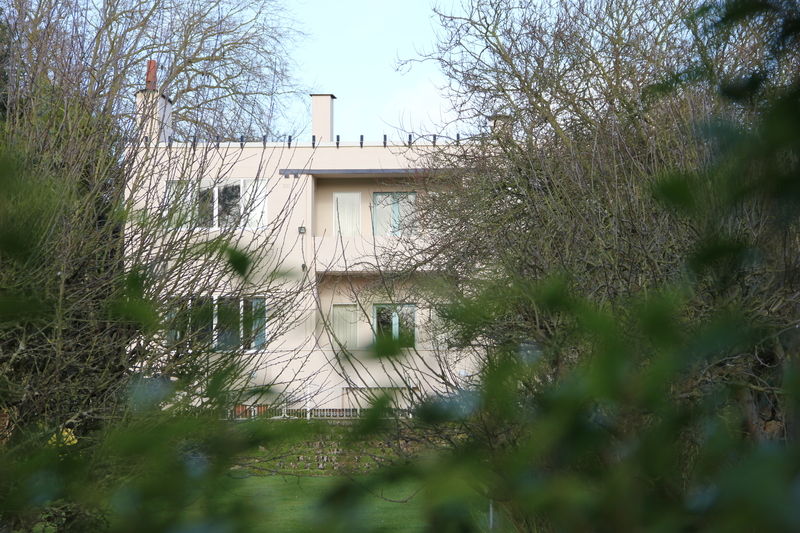 By the end of January, I’d had a little ride locally around Northampton looking a two pieces of modernist architecture – in particular, “New Ways”, the house designed by Peter Behrens just after the First World War. At the time, Behrens was Head of the School of Modern Architecture in Vienna. The driving force in Northampton was a man called W J (Wenman Joseph) Bassett-Lowke. He had built up a business in model engineering. His model railways, mostly in “O” gauge (compared to the “OO” or “HO” gauge – for the former of which Frank Hornby came up with “Hornby Dublo” as a brand name which represented both the brand and the scale), were produced from the 1920s to the 1960s. 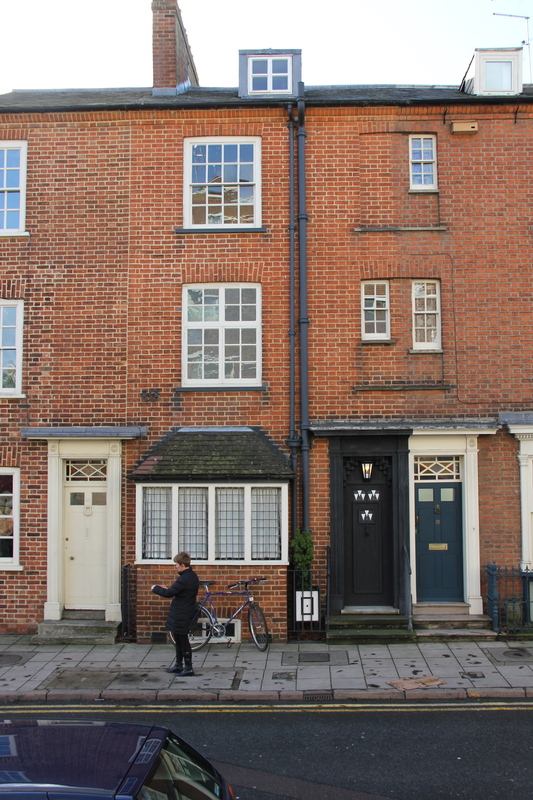 Thanks to the work of a local trust, WJ’s house at 78 Derngate, Northampton, is well known as the only house in England whose interior was largely designed by Charles Rennie Mackintosh. Closed to visitors in the winter months, this is the outside which gives only a little hint, in the style of the door, of the treasures within. So far, so well known. 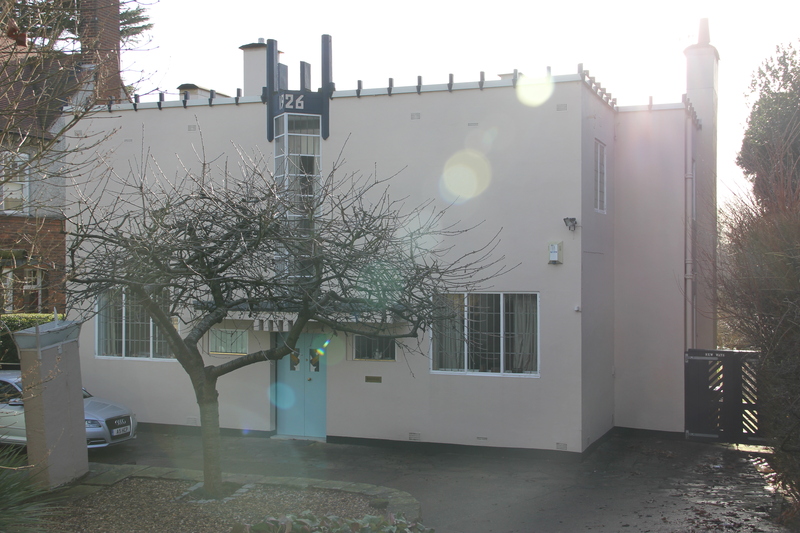 Bassett-Lowke had hired Rennie Mackintosh in 1916 but, when the war was over, WJ decided to build himself a new house in a completely modern style. This house, because it is still privately owned, is little known beyond a black-and-white photo and a description by Pevsner in his volume for Northamptonshire (1961, rev 1973). It also appears dwarfed by its later neighbours. Through the Werkbund Jahrbuch, WJ knew of the factories and other buildings in Berlin, Dusseldorf and Frankfurt designed before the war by Peter Behrens. He wrote to Behrens in Vienna and they agreed to meet in Paris. WJ took his builder with him to the meeting as Behrens made clear he would not visit Northampton. 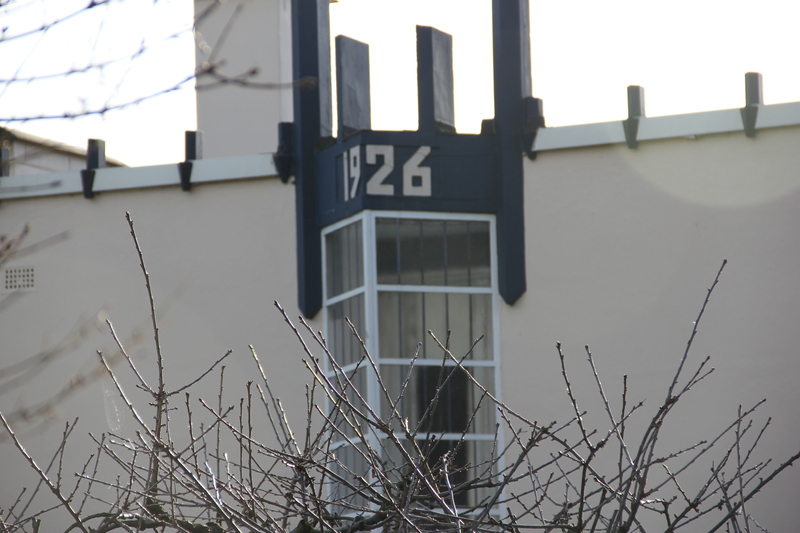 By 1926 the house was built. Here is a view of the front, or entrance, side. The photographer for the Pevsner volume must have stood on the same spot on the pavement. 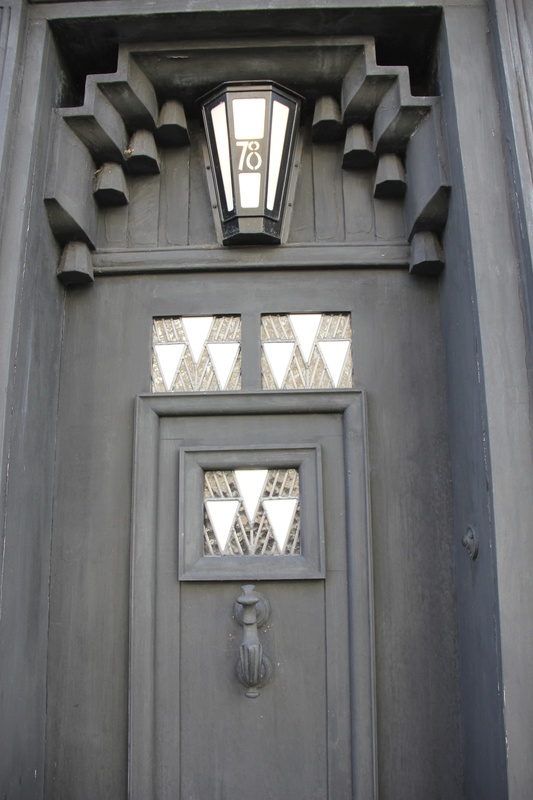 Here is a detail of the front side, the triangular projecting staircase window. Pevsner described this as “a completely new style of architecture then entirely untried in Britain … How revolutionary this style must have appeared at the time …” So far, so Google Street View. Pevsner goes on to say that “how prophetic it was of the future … can only be seen from the garden side.” He didn’t include a photograph of this facade. 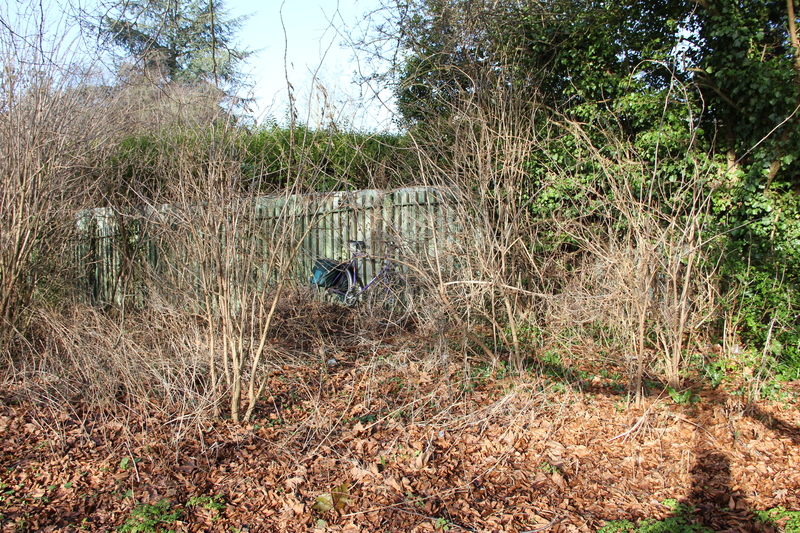 But the garden does back on to Abington Park. 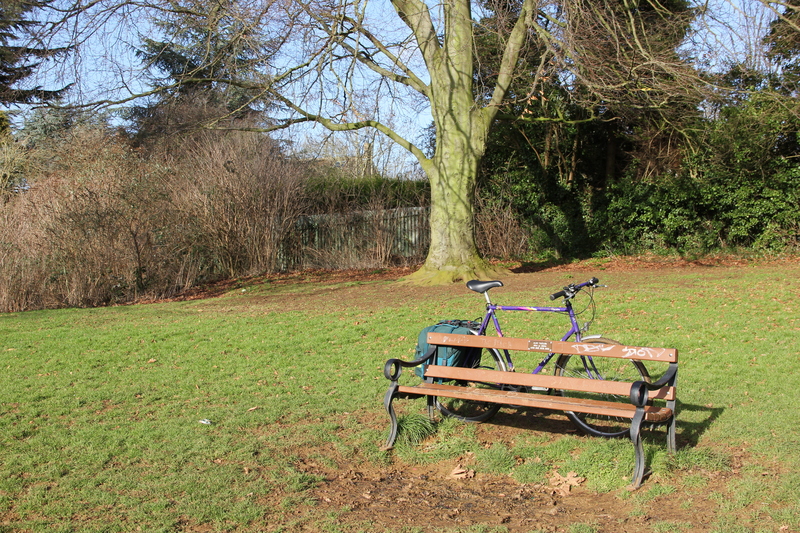 Strolling through the park with my bicycle did not offer a promising view. The fences and vegetation are high. An old bicycle, however, can double as a ladder. Peter Behrens provided decorative schemes for the lounge and the dining room, although the dining table and chairs came from 78 Derngate, as did the furniture, also designed by Mackintosh, for the study and the main bedroom. The two blended well, noted Pevsner, owing to the remarkable fact that Mackintosh had turned quite independently from his exquisite Art Nouveau to a private Expressionism. The whole was featured in an article in “The Architectural Review” in 1926 and again in “Decoration of the House Beautiful” in 1932.